We present two works by this Montreal artist, also a professor at the school of industrial design at Université de Montréal. Firmly established in the Montreal media arts community and co-founder and long time chair of the Society for Arts and Technology (SAT), Courchesne began his artistic career with his first short videos in the late 1970s and early 1980s; during the latter decade, he studied at the Massachusetts Institute of Technology (MIT), where he was a colleague of Jim Campbell. It was here that Courchesne conducted his initial interactive technology experiments. 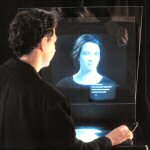 In 1990, he produced Portrait One, a work that was highly important due in part to the fact that its interactivity was based on dialogue. The artist placed his work and its relationship to the spectator/interactor within a dialogic structure. Portrait One is a work of fiction and a framed encounter with a character. As a portrait, it is unlike a photograph. The latter conjures up Barthes words ça a été (1) and ultimately death, while Courchesnes interactive portrait is experienced in the present of the conversation, although, as we will see, it may refer to the past, not as what has been or is dead, but rather as what is forever happening in the present of verbal interaction. 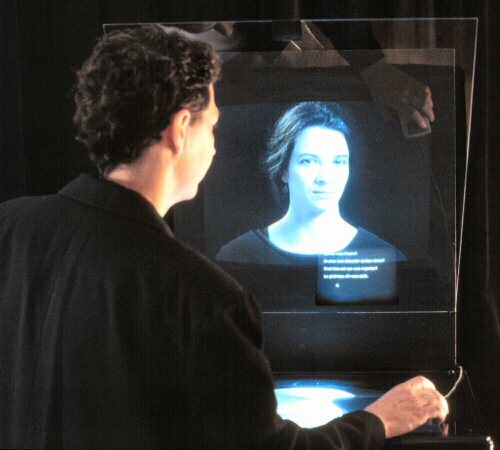 Thus, the interactive portrait calls to me as interlocutor, and in fact it does not reveal as much of the portrayed subject as it does of myself as I engage in the dialogic dynamic of exchange. Thus, it is my own subjective positioning that is played out through language, through verbal interactions, and through exchange. (2) Courchesne created a number of other portraits, including Family Portrait (1993) and The Hall of Shadows (1996). He then turned his sights outdoors with Landscape One (1997), which prompted him to abandon the portrait for more immersive environments. As the new millennium dawned, he also focused his efforts on the creation of the panoscope, an immersive projection system. (3) The resulting work, supported by a grant from the Foundation, was The Visitors: Living by Numbers (2001). 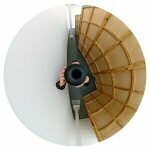 This research, which examined both the devices associated with immersive cinema and the realisation of an artistic project using these devices, gradually piqued his interest in panoscopic phenomenology, which has since been reflected in the spellbinding series of photographs he has produced in recent years. A very simple camera movement (dolly in), inspired by the film Wavelength (1966-67) by Michael Snow, pulls viewers across a space to a scenic unit that completely redefines the experience. A circular anamorphic image is produced, which presents the horizon in its entirety. This image is continuously reoriented as events unfold, as if the viewer could turn his or her head without losing sight of the entire scene or having to change positions. It is interesting to note that two of the works in our exhibition are tributes to Michael Snow and his celebrated film Wavelength  the other tribute coming from Jim Campbell. Snow also worked with the Foundation when creating his work anarchive 2: Digital Snow (2002), (4) which can be accessed on a one of computer stations placed in the same exhibition space as Courchesnes works. The association between the recent work by Courchesne and Snows film is not fortuitous, nor is the association with Jim Campbell, for all three artists embrace a phenomenology of vision and recognition of images, and all three assert the temporal dimension of a work of art through perception and ones awareness of it. (1) Roland Barthes, Camera Lucida: Reflections on Photography (New York: Hill and Wang, 1981)..
(4) Anarchive 2: Digital Snow (Montreal: The Daniel Langlois Foundation for Art, Science, and Technology, 2002). DVD-ROM. 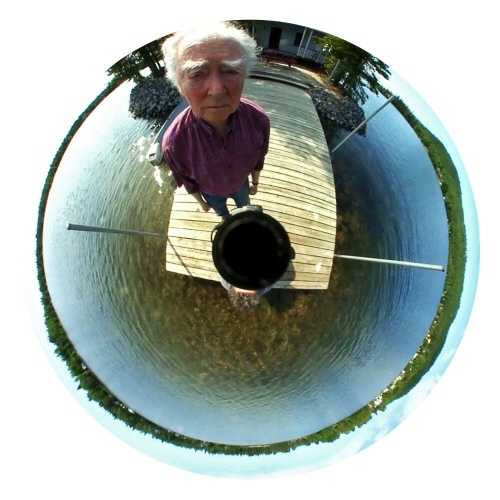 Luc Courchesne is actively involved in the fields of design and experimental video. He is currently vice-president of the Society for Arts and Technology (SAT) in Montreal and a professor at the school of industrial design at the Université de Montréal. In the 1970s, Courchesne obtained a B.A. in Communications Design from the Nova Scotia College of Art and Design, and in the 1980s, he earned a Master of Science in Visual Studies from the Massachusetts Institute of Technology (MIT). His works have been shown at numerous exhibitions and screenings, notably at the National Gallery of Canada, the Museum of Modern Art in New York, the Musée dart contemporain de Montréal, and events such as ARCO 2007 in Madrid (Spain) and Lille (France), European Capital of Culture 2004. He has also completed artist-in-residence programs at the Institut méditerranéen de recherche et de creation (IMREC) in Marseilles (France), the Zentrum für Kunst und Medientechnologie in Karlsruhe (Germany), and the Museum of New Zealand. He has been the recipient of many awards, including the Grand Prize of the 1997 Biennale of the InterCommunication Center (ICC) in Tokyo, and he earned an Honorary Mention in the Interactive Art category at the 2002 Ars Electronica Festival (Linz, Austria).